15 slots, "32" volumes. Hey, who has my Harry Potter POA? It’s all Donna’s fault, really. Her off-hand comment led me to commit to reducing my entire collection of books to a total of 250 titles. Titles not volumes. Multiple books in a series count as one title. Otherwise, as a devotee of series, it simply couldn’t be done. Regular blog posts are chronicling my culling efforts, separating the wheat from the chaff, so to speak. I say that, because most of these books are wheat. I have loved them, well most of them. 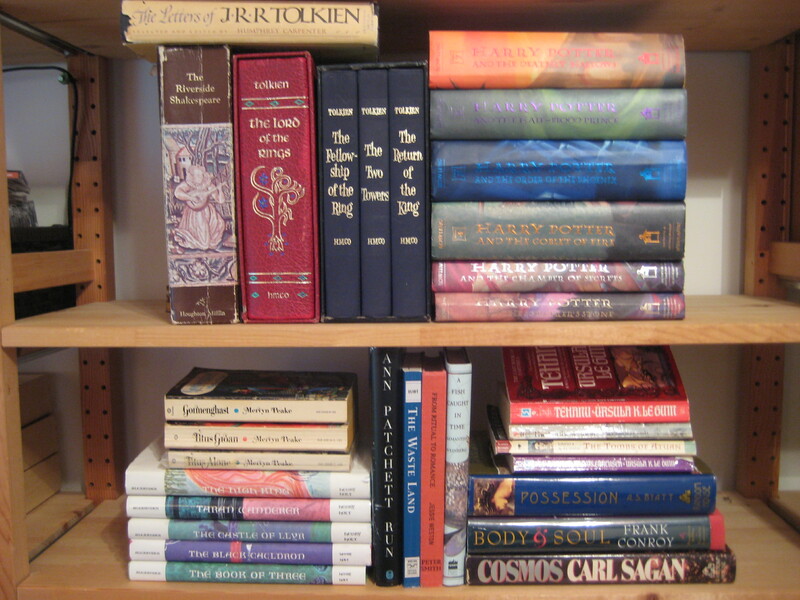 But I am trying to get to my goal, my Very Streamlined Library of no more than 250 books. Titles? I think I’m going to have to just say “books,” with the series exception being understood. I truly just started listing titles, when a crucial point came up. This is not just my library! I don’t exist in a vacuum. Sam’s books are Sam’s books, he will take them sometime in the future. I guess we are his book mobile until then. But more importantly, my library is also Paul’s library. Paul does have a Kindle now, and I admire its efficiency. But more than I love anything about his Kindle, I love my library, my public library. Talk about efficient! With my library card, I have access to the Number One Rated Library in the whole country, the Naperville Public Library. * And I can ride my bike to it, too. Maybe I don’t even need 250 books! No wait! I didn’t say that! I know that someday I will arrive at the 250th entry on my list. And even though there will be a satisfying sense of completion, of having reached my stated goal, I very much anticipate that that list will be only a snapshot, an ephemeral version still subject to changing priorities and sensibilities. Of course, certain core titles will never leave and are non-negotiable facts of my continued existence. A list-within-the-list would be of the few precious books I would, if the safety of my loved ones were assured, rescue from a fire (see numbers 1 and 2). But at the margins of even this eventually pared down catalog, there is room for reevaluation and growth. I do enjoy the concept of “one in/one out” especially as it relates to clothes. This may become a guiding principle when my list finally reaches its stated capacity. In that way, the whole endeavor mirrors the title of my blog, process not product. I fully believe you’ve got to be willing to embrace the zen in certain aspects of your life. Now about marginalia: this is a critical concept to me. My Riverside Shakespeare is precious to me not just because it is the best edition of the plays and sonnets (I was brainwashed years ago by my undergraduate Shakespeare professor, so don’t try to argue that point with me). This book is filled with, covered in and enriched by the notes I took on its very pages during my own “salad days,” when I was certainly “green in judgment” if not “cold in blood.” Marginalia is the conversation we have both with and about our books and is an endlessly fascinating concept to me. But let’s face it, as Donna so rightly points out, it is unacceptable to write in library books unless you want the wrath of a Madam Pince to come crashing down on you. My solution to this problem is to keep a journal associated with my borrowed-books reading. It’s a little more cumbersome than simply writing in the book. You have to note page numbers and paraphrase a bit, but it is a great tool for maintaining a record of your reading and reading thoughts. My only regret is that I was not more systematic when I started. I’d really prefer something with tabs, you know, so it would be more organized (quel surpris). As I add to the keep-pile, I will add their titles to the list here. At some point, I will start to categorize them, but not yet. For now, it’s just a random list of what are clearly some of my/our favorite books, the ones we intend to keep. The Riverside Shakespeare with my classroom marginalia. The Lord of the Rings. The one-volume red-leather slip-cased edition Donna gave me when I was about 14. The Lord of the Rings. Paul’s three-volume slip-cased edition. We are attached to our memories of these copies. The Letters of JRR Tolkien. Wonderfully insightful and comforting. A Fish Caught in Time. The riveting story of finding coelacanths, my favorite example of a living-fossil. The Prydain Chronicles. Before Frodo and Harry, for me, there was Taran. The Gormenghast Trilogy. Donna found copies of these for me when they were out-of-print. Treasures! Run by Ann Patchett. I want to be Ann Patchett when I grow up. Or when I’m a grown-up writer. From Ritual to Romance by Jessie Weston. Lovers of The Waste Land know this as crucial source material. Cosmos by Carl Sagan. There was such a weary optimism to Carl Sagan’s genius. I respect that quality. The Wizard of Earthsea Trilogy and Tehanu by Ursula K. LeGuin. Tehanu was a heartbreaking sequel published 15 years later. Body and Soul by Frank Conroy. I admit I really enjoy this book, but this one’s for Paul. To Kill a Mockingbird by Harper Lee– oh yes, it is. The Compact Oxford English Dictionary, with magnifying glass. Star Wars: A Pop-Up Guide to the Galaxy by Matthew Reinhart. Mind blowing. A beloved gift from beloved friends, who make their own stunning paper-art. The Art of Walt Disney by Christopher Finch. Of course, I wanted to be a princess, but far more I wanted to be a Mouseketeer. Katharine by Anya Seton. So much of my family’s reading history in this historical novel. His Dark Materials Trilogy by Philip Pullman. A fantastic rationalist spins an alternative-Earth fantasy. The New Food Lover’s Companion, third edition. Indispensable reference guide and a delicious read. Summer by Alice Low. The sweetest evocation of my Summers. I still choke up, yes choke up, at the single line next to the children building a sandcastle: “We like this way to spend a day.” It didn’t need a couplet to express this simple truth. Genius. All About Sam by Lois Lowry. It’s all in the title. Green Eggs and Ham by the Doc. #24 and 25, with sweetest memories of baby Sam. The Earthly Paradise and the Renaissance Epic by Bart Giamatti. Timeless musings by Yale prez. and (briefly) MLB commish; timely regrets for Messrs. Gallarraga and Joyce. What’s Bred in the Bone by Robertson Davies. For art enthusiasts (and art-forging enthusiasts) everywhere. A wink and a nod, Donna. The Ghosts’ Trip to Loch Ness by Jacques Duquennoy. Highland fun with a life of its own. Calendar by David Ewing Duncan. Tranquilla non movere. The original Quirky book. Dictionary of Classical, Biblical and Literary Allusions. Lass et al, eds. Invaluable. Inventing the Middle Ages by Norman F. Cantor. Compulsively readable intellectual history appraising the scholars who formed our conceptions of the Middle Ages. Life and Adventures of Nicholas Nickleby by Charles Dickens. Why Nick Nich over any any other Dickens? For the line, “There is always hope:” NN to Smike, the real hero. Nobel House by James Clavell. I learned more about finance from this taut page-turner than I did in any econ class. I also love Clavell’s Tai Pan, but alas, I found it a bit dated the last time I picked it up. Lilly’s Purple Plastic Purse by Kevin Henkes. We still reference Lilly’s resilience: “Today was a tough day; tomorrow will be better.” A classic. Julius is about the triumph of family bonds and sweet white fur (that’s for you, Melly Cat). A Year in Provence by Peter Mayle. A votre sante. John Milton: Complete Poems and Major Prose, Merritt Hughes, ed. Sympathy for the Devil, I love Paradise Lost. This edition rocks. The Selected Works of T.S. Spivet by Reif Larsen. So far, the newest book on my list which could make it a controversial choice. How quickly can you elevate a new love to equal status with the works that have informed you since childhood and be comfortable with the decision? I’ll let you know. Cars and Trucks and Things That Go by Richard Scarry; 10 Minutes till Bedtime by Peggy Rathmann; Tacky the Penguin by Helen Lester. I’m starting to believe I will eventually gather all the picture books under one listing. So far, that would include 5 other books. Yep, with only 250 slots, I think it’s a cert. Classical Music: The Top 50 Greatest Composers/1000 Greatest Works by Phil Goulding. Tremendous gift from my sister which has become a family project– working our way through the list over lovely dinners, and taking notes. All agree: would trade Janacek (#48) or Hindemith (#32?!) for Aaron Copland any day of the week, month, year. 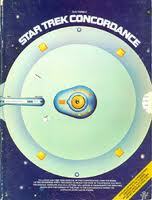 The Star Trek Concordance by Bjo Trimble. I can’t believe it took me to #42 to include this title. Not only an indispensable reference guide for Trekkies (yes, Trekkies) but one of the coolest, geekiest covers ever (low-tech spinner for high-tech fans– awesome). Four by Simon Winchester: The Professor and the Madman, The Map the Changed the World, Krakatoa, and A Crack in the Edge of the World. I am seldom a more satisfied reader than when a gifted non-fiction writer constructs a cracking good tale out of historical events. Who knew there was so much drama to compiling a massive dictionary? Check out Winchester’s Professor/Madman and be amazed! Then just keep reading his other books. Hi, sister mine. This seems like a perfect point to bring up a connumdrum: When one is in the process of “weeding” the personal library, how does one deal with the unexpected desire to add a new title to what is supposed to be a shrinking collection? To be more specific, I was introduced to “Siddhartha” this week and while I know that I can always get it at the public library (Fairfax County has a not-too-shoddy system of its own), marginalia is frowned upon when one is dealing with books from that source. Is a puzzlement. I’m so happy Gormenghast isn’t going on ebay. I would still like to read it someday. Just finished “Siddhartha.” Still working on “The 19th Wife.” Gotta pick up a book of my own choosing. (Actually, I’m also reading book number 6 in the #1LDA. Oh, and “Le Petit Prince” et “The Little Prince” so strike that earlier comment.) So many books — so little time. I started reading “Bred in the Bone” yesterday. I’m only on chapter 2, but I’ll keep you posted. There was a cute story Julia Roberts told on Oprah the day she was on to talk about “Eat, Pray, Love.” She said that when she was about thirty pages into reading the book, she realized that it had so many connections for her that she needed to be able to share it with someone. So she called her best friend and told her to get the book immediately and start reading it. JR said she needed to know that someone she cared about was also reading it at the same time she was. That’s one of the joys of a book club, I think. You know you’re having a concurrent experience with people who will want to share later. I pulled the books off the library shelves so that I cold replace the no-longer-;leasing cranberry color with a very beautiful approximation of M S’s Atlantic. Talk about an instant way to force yourself to identify the books you’d keep as opposed to the books you’re just keeping! We realized very quickly that if we put all of the books back on the shelves, the very beautiful new color would hardly show at all. Ah, but what to remove in order to leave space? Haven’t counted, but I believe there are more than 250 books still standing, so to speak. But not too many more — at least not up here. As a big library user, I love the idea of a book journal!